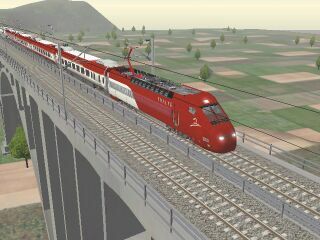 The LGV Med route became available at the Train-Sim.com file library in file lgvmed.zip (19.9Mb) at the end of July. This route is a feasible download across a standard dialup connection and worth the world wide wait. There's a page describing how to best set up Chris Longhurst's Eurostar and this page gives you another trainset suitable for the high speed capability of LGV Med, namely the TGV Thalys. Visit the LGV Med author's site at perso.wanadoo.fr/lucweb/lgvmed/eng/ for screenshots, route description, FAQs and information about the TGV signalling system. 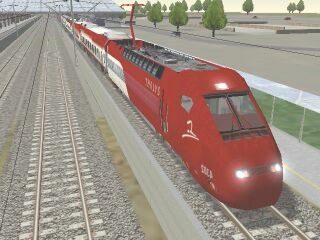 You'll find the Thalys PBKA transet, thalys.zip (01-Dec-01, 3Mb) on page 2 of the downloads section of www.msts.nl. For a compatible cab, head to the the Train-Sim.com file library to download Kenji Kimura's Reseau TGV cab, tgv_rcab (1.2Mb, 10-Aug-02) which has the TVM430 in-cab signalling system. Note: the tgvcab2.zip, (2.5Mb, 25-Apr-02), was originally specified but it's without the TVM430 system. No changes are needed to the Cabview line in ENGine file below. To install both the Thalys and cabview, use the drag and drop method to extract files from the zip and place them in their folders in Explorer. So have WinZip open in a minimised window and Explorer opened in a maximised window. In other words, ignore both "readmes" and we're not going to use the folder paths in the zips. In Explorer, move to the the Trainset folder, highlight it and create a new sub-folder named Thalys. Now select the Thalys sub-folder, with a nice empty right-hand pane. Back in the WinZip window, use the Actions menu to Select all files then de-select the CONsist file with a CTRL-click. Holding down the left mouse button over the selected files, move them to the empty right-hand pane of Explorer. To extract the CONsist file, in Explorer highlight the Consists folder (it's just above the Trainset folder). Back in WinZip, select TGV Thalys PKBA.con and drag it onto the open Consists folder in Explorer. It's a similar method to extract the files for the cabview. In Explorer, highlight the Thalys folder and create a new sub-folder named Cabview. Select this Cabview sub-folder. With tgv_rcab.zip loaded in WinZip, select all the files, except the JPGs, Readme and File_id.diz, and drag them onto Explorer. All done! We don't need a Sound sub-folder - we'll alias to the Acela sounds in the Thalys ENG file (see below). Before leaving the Train-sim.com file library, download and install the enhanced electric train sounds by Joseph Realmuto, elecsnds.zip if you haven't already. These sounds give you brake rumble and brake squeal, the former being particularly important when slowing the Thalys - some audio cues are particularly helpful with so much happening so quickly. We'll be running the Thalys PBKA trainset which is an 8-passenger car consist of Power-Endcar-Car-Car-Car-Bistro-First-First-End-Power. This trainset weighs 385 tonnes and has 8800kW power at the rail under the 25kV catenary system, its traction system being the same as the TGV Atlantique. The TGVWeb site has some technical specifications. So get WordPad fired up and load up the Eurostar ENG file, eurostar.eng. The changes you need to make are shown below in red and dotted lines mean you'll need to scroll down the file a few lines. The individual mass values for power cars and passenger cars may not be correct but they give a total mass of 386 tonne for a Thalys 8-passenger car trainset, as per the specifications. Even though there are some activities in the LGV Med download, there are no accompanying consists. Running ConBuilder and checking these activities, you'll find that a consist named tgvres1.con is missing. It's a simple task to make one. Open Explorer and navigate to the Train Simular consists folder. Look for a consist named TGV Thalys PKBA.con. Make a copy of this file (click Copy then Paste on the toolbar). Scroll down the end of the file list and rename Copy of TGV Thalys PKBA.con to tgvres1.con. If you've already got a tgvres1.con which you've been using for the Eurostar, then before the above step, rename tgvres1.con to tgvres1-euro.con so it's easy to later change consists by simply re-naming them.